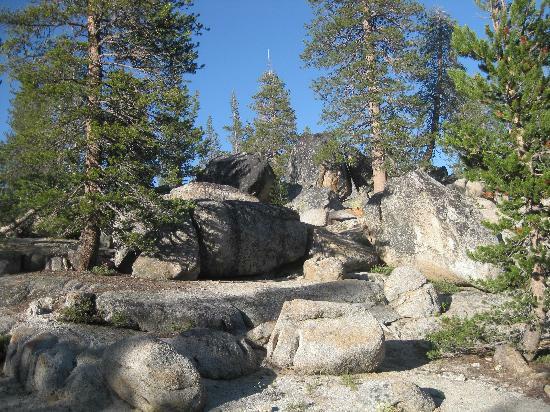 Description: SF Hiking Club has reserved several tent-cabins in Yosemite at White Wolf Lodge (elevation near 8000 ft) for August 9-12. This weekend is the Club’s traditional summer outing to Yosemite. Hike possibilities vary and will be determined later. Suggestions and leaders are welcome. (Please contact Troy and Carl with your suggestions.) There are beds for four people in each cabin with sheets, blankets, towels, soap, candles, and firewood and wood-burning stoves. Showers and restrooms are centrally located. Space is limited. Reservations are now open. A check will be necessary to secure your reservation. Spaces are reserved based upon when we receive your check. Lodging cost is $130 per person for the three nights (Thursday, Friday, Saturday). We do not accept a reservation and check for only one or two nights. The $130 is nonrefundable unless another Club member takes your place. Please mail your reservation check, payable to San Francisco Hiking Club, to the following address: San Francisco Hiking Club, PO Box 14065, San Francisco, CA 94114. Important: Please write "Yosemite" on the outside of your envelope. We will confirm your reservation by email (but not during May 25 - June 18 when Troy and Carl are away). White Wolf has a dining room that serves breakfast and dinner and makes bag lunches (prices vary). Club members commonly eat breakfast and dinner together at the dining room. You can bring nonperishable food to store in the bear-proof lockers that are provided. White Wolf does not permit cooking fires or camp stoves. Transportation must be individually arranged. Carpooling is encouraged. As the trip gets closer, we will share a list of hikers who are going to help arrange carpools. This trip is available to Club members and no more than one guest per member. Once all the spaces are filled, we will maintain a wait list in case of cancellations. Yosemite entrance fee is $35 per car for seven days or a Yosemite or National Parks pass. Each participant is responsible for complying with all park regulations and state and federal laws. For more information about Yosemite, see www.nps.gov/yose. For more information about White Wolf Lodge, see http://www.travelyosemite.com/lodging/white-wolf-lodge/. Please email Troy (troybuckmeier@mac.com) and Carl (carl@sfhiking.com) if you have questions about this trip.